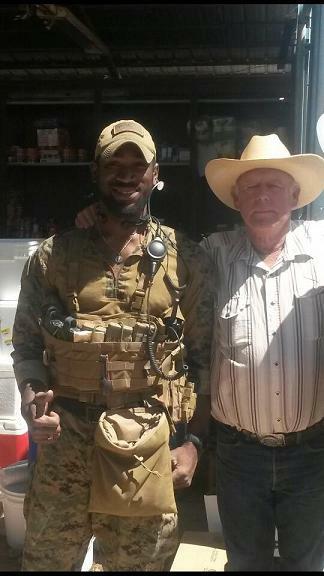 Charlie Delta and Cliven Bundy Stand together. From Facebook … >>>Here<<< Please make viral. "The media distorts information to the point of social division. This is a photo of myself and the resilient, often charismatic, and maybe not so tactful Cliven Bundy. He's a cowboy and a helluva family man, not an orator. One thing he definitely isn't - a racist. I found his comments to not only be NOT racist, but his own view of his experiences. Who the heck are we to determine another man's perspective on the world around him?! Just because Picasso's view of the world was abstract, does it negate the fact that his art was genuine? Furthermore, if you take the time to do your own research, you'll find that his statements about some black Americans actually hold weight. He posed a hypothetical question. He said, "I wonder IF" ... Hell, I'm black and I often wonder about the same about the decline of the black family. Bottom line is that we are all slaves in this waning republic, no matter our skin color. Mr. Bundy could have used any racial demographic as an example: Native Americans on reservations, whites in trailer parks, etc. He noticed the crippling effects of receiving government "assistance" and the long term result of accepting handouts. It's not progress at all. I challenge Sean Hannity, Rand Paul, and others to read my comment and reconsider their position in this matter. Individual liberties are at stake here, yours and mine. THAT is the issue. Don't let the liberal media and ignoramuses like Glenn Beck and that weasel Harry Reid make you lose sight of the real issue here: The federal government is a burgeoning behemoth and a bully on a once constitutional playground. I sincerely hope you real patriots out there who can see through the smoke. Semper Fidelis ************************************* The New York times has tried to undermine public support for The Bundy's by gross distortion of Cliven's public statements about the plight of Americans, esp Blacks under the current socialist tyranny.... and they hacked and re-hashed his comments to make him out to be a stupid racist. Now obviously Cliven is no polished PR expert, yet to label him a racist is a disgusting slur...a lie yet a typical tactic of Tyranny loving lefty Obama sycophants. When the Media have gotten into bed with corrupt government they have utterly failed in their moral duty. Thankfully demonstrations of solidarity like these above show that you cant fool all the people… all the time. 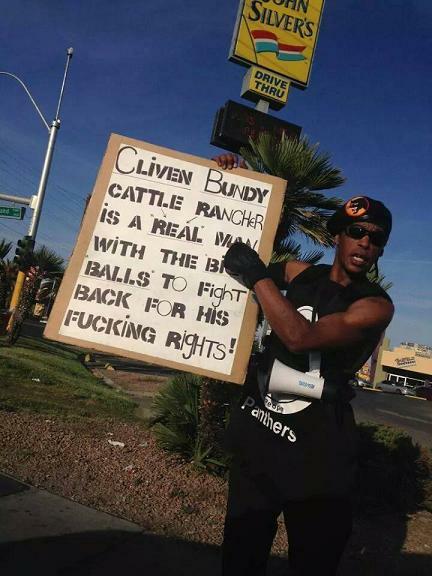 Read this Infowars article and watch Cliven Bundy’s full discourse … >>>InfoWars: Bundy tape was edited to exclude his ‘pro-black, pro-Mexican’ comments<<< Read more on the Bundy Resistance.... US State Terrorism. Pretext to abolish the second Amendment. Bundy’s declared ‘Domestic Terrorists’.